Packet Pickup: We don’t have traditional race packets. If you ordered a t-shirt you may pick it up Friday at Rogue Valley Runners in Ashland between 3 and 6PM. It is a great place to hang out with other runners and get pumped for Saturday’s event. We start signing in 15K runners at 7:15, providing race numbers and chips for timing. If you didn’t pick up the shirt you ordered on Friday it must be picked up before your race. There is a separate line for shirt and mug pick up. 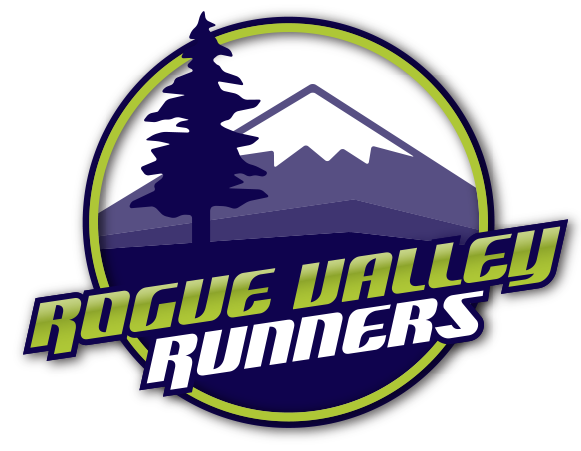 We encourage you to drop by our friends at Rogue Valley Runners on Friday to pick up last minute racing needs and running advice from Oregon’s finest running store. Don’t worry, the traditional SWAG will be provided as you cross the finish line! Directions to Start: Take the Interstate 5 Mount Ashland exit (exit #6), located 10 miles south of Ashland and 5 miles north of the California/Oregon border. Follow the signs to the ski area located about 8 miles from the Interstate. If driving from Ashland, please allow at least 40 minutes driving time to get there. Age Divisions: Men and Women: less than 15, 15-19, 20-29, 30-39, 40-49, 50-59, 60-69 and 70 and over. From the start at Mt. Ashland Ski parking lot, the course heads west to a junction with fire road 40S15 (.5 miles) before intersecting with the Pacific Crest Trail (PCT). You turn right onto the PCT and follow the trail to the Grouse Gap aid station. From the aid station, the trail climbs to the saddle, and then contours to the Willamette Meridian turn around. Water will be available at this point. The course leaves the Willamette Meridian on Rd 20 and heads east back to the Grouse Gap aid station. Be sure to stay on the road all the way to the aid station. From Grouse Gap aid station, the course then heads to Mt. Ashland via the PCT to the junction with Rd 40S15. Turn left onto Rd 40S15 and follow all the way back to the Mt. Ashland parking lot finish line! Grouse Gap and Willamette aid stations provide water. There will be snacks and drinks at the finish line, plus an optional full lunch is available for the 15k runners at the finish for an additional $10. All entrants will also be automatically entered into the S.O.B. Raffle! Check the raffle board after the race to see if you won anything! 1. The race begins at 8:30 am. 3. The course is marked with pink flagging. You should never go more than 1/4 mile without seeing the flagging. 4. If you drop from the run, you must notify the aid station captain. If we have no record of you either finishing or dropping, we will be forced to call search and rescue. 5. No dogs will be allowed on the course! Leashed dogs are only allowed in the Mount Ashland parking area. 6. Course cutters will be disqualified. 7. Crews are not permitted to drive on the course. 8. Please NO littering! Help us maintain the beauty of this course. Pack your garbage to the nearest aid station. 9. NO exchanging of bib numbers. Registered runners only. This is critical to the safe tracking of all participants. 10. We would like to minimize our use of plastic bottles after the race. We will gladly serve post race beverages into your water bottles.